Indeed, the quote is very true, if we all could have a soulmate who is actually the best friend of our life. 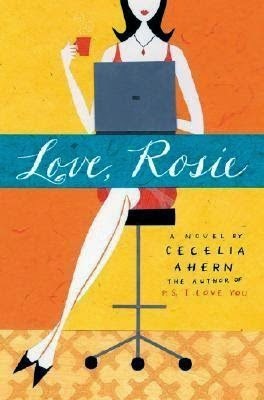 Cecelia Ahern's, the international best-selling Irish author, novel, Love, Rosie is a sweet love story between two childhood besties- a girl and a boy. Well, I wish, I could have read this book, before The Year I Met You, which is far more better and I guess the best of her creation till date. Love, Rosie falls short in the category of the characterization. We'll talk about that in a while, but now let's get into the synopsis part. To be honest, I have watched the movie and it's not that good or even justifies the book/plot in anyway. PS: Watch it, only if you're a big fan of Lilly Collins, she falls perfectly into the shoes of Ahern's Rosie character and does full justice to her role. Well, I was expecting some other dude other than Sam Claflin on Alex's shoes. He is not good, and ruins all those oh-so-innocent Alex moments in the film. The storyline was kept similar to that of the book, but there were many important scenes which were not included in the movie version. Okay now let's get to the story- I don't know why Ahern's story-telling is always so flawless, like a full-length movie unfolding right in front of our eyes. The plot, ah well, it's sweet, young love matured to adult love, and Ahern teaches us a lesson or two with this book that Love has really no age. Alex and Rosie's childhood friendship is depicted strikingly and how eventually Rosie's love for Alex turns into something rich, deep and meaningful, and how it was sad to see that Alex was still lagging behind in the matters of his heart. The characterization could have been much more stronger based on the fact that Rosie and Alex both grew up from their innocence and both had responsibilities and mistakes to take care of, but Ahern left them as the kids and inside a vicious circle of fate where misfortune happens for over more than a decade and somewhere in the middle, I felt so boring with the same set of events happening in their lives- like they never want to grow up in their skin. Maybe that was the whole point to make the plot a sad sob story. The emotional content is quite powerful since the author described those heart-breaking events with love, compassion and utmost depth, thus pulling us into the sadness, even though we don't want to be a part of it. And the climax simply made me feel better with the story and I eventually fell in love with Rosie and Alex's unfortunate, heart-wrenching and tear-jerking story. Do watch the movie version, if you are a big fan of Lilly Collins and Cecelia Ahern. Verdict: Sad stories are really required to maintain the balance of our happiness and Love, Rosie falls into that category perfectly.